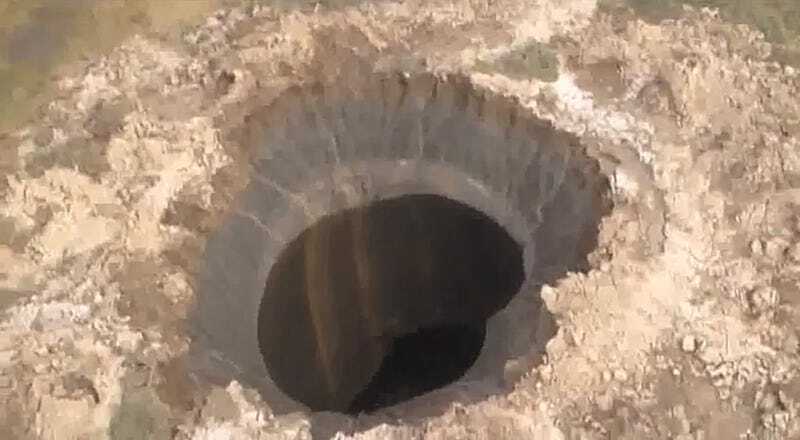 A mysterious giant hole and crater have suddenly appeared in Siberia, Russia. There are not many details right now, but the video captured from a helicopter shows a weird configuration with debris and signs of combustion around it. What the hell is this? Update: New pictures and video show the interior of the hole in detail. The hole is about 262 feet (80 meters) in diameter and it certainly doesn't look like a sinkhole, although you can see a large cavern under it. The video was filmed from a helicopter over the Yamal Peninsula, the location of major gas fields discovered in 1972 and currently being exploited by the Russian energy giant Gazprom. That sounds like the most likely possibility indeed. At least more plausible than the alternative theories: Meteors, giant worm from hell coming out of its lair, and drilling UFOs. According to the Russian paper, there's an expedition on its way that "includes two experts from the Centre for the Study of the Arctic and one from Cryosphere Institute of the Russian Academy of Sciences. They plan to take samples of soil, air and water from the scene." The permafrost [frozen earth] can be hundreds of metres thick, allowing for large ice features. This is obviously a very extreme version of that, and if there's been any interaction with the gas in the area, that is a question that could only be answered by going there. We're seeing much more activity in permafrost areas than we've seen in the historical past. A lot of this relates to this high degree of warming around these high arctic areas which are experiencing some of the highest rates of warming on earth.